Maxstor’s Pipe and joint system in India is lean manufacturing made of high-quality steel after surface treatment, steel pipe with plastic resin coating, the outer surface of the pipe is of ABS plastic, inner surface coating is of antirust. ABS coated pipe is of 28mm diameter and thickness is 0.8mm / 1.0mm. 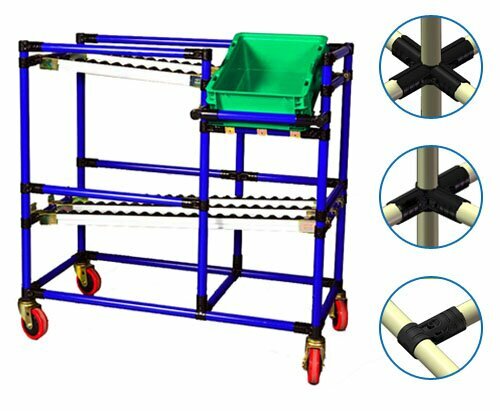 All the items such as racks, workstation, trolley is made up of ABS Coated Pipes, Metal Joints, Metal accessories, roller tracks and casters making the installation, adjustment, modification, alteration take-down to be easy. All the items as metal joints, pipes can be reused and recycled, thus it is totally eco-friendly, environmental and economical. Maxstor is Pipe and joint system manufacturer and supplier in India which is widely applied on electronic, automobile industry, warehouse, logistic system, lean manufacturing, and production line. Maxstor is a direct material manufacturer of the items, due to which our price is more competitive. As at to be a one-stop supplier, we can provide with all comprehensive types of products and customisation is undertaken as per requirement. Pipe and joint system can be rebuilt according to requirement and application, and no special technical skills or special tools required. Continuous reforming activities are possible.